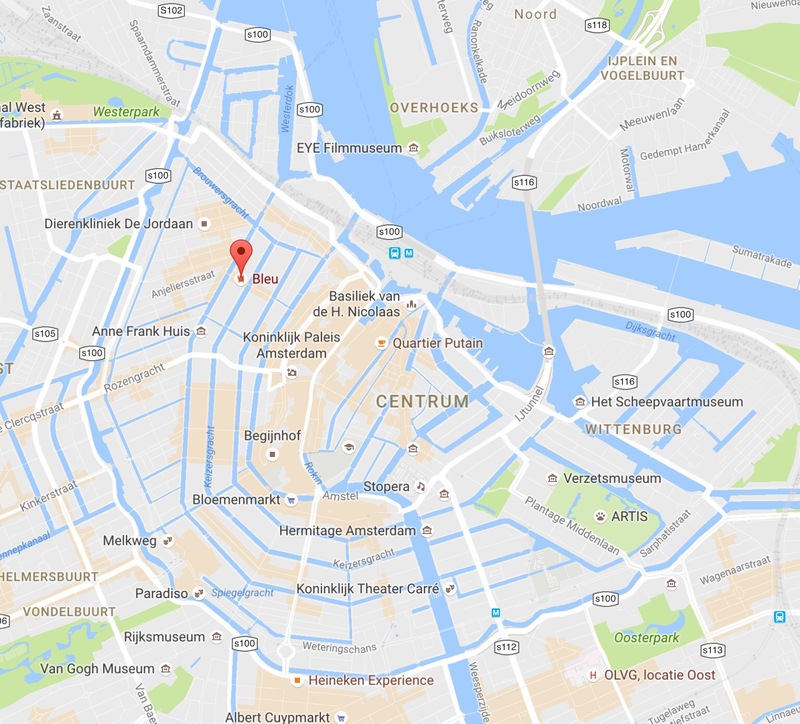 I had previously shared some good eats in Amsterdam here, but I wanted to note and report on a few of the places we visited this time. I have heaped praise on De Kas once before, but if ever there a restaurant worth traveling for, to me, this is it. De Kas is located in a greenhouse, so diners sit in this beautiful glass space, full of light and space. We started with this soup, crab and watermelon. It sounds odd, but that is one of the things I love about De Kas. Becacuse it based on food that is in season, you can end up with unexpected tastes that actually work well together. Our next course was a grilled eggplant and zucchini salad, simply arranged and prepared, but fresh and delicious. It was followed by a fish main course, which was also tasty. The staff is friendly, knowledgeable, and attentive. We had gone to De Kas becuase we love it the previous time, but it was also a special occasion. The view as we were leaving De Kas after dinner, vowing to return on our next trip. De Plantage is another fun restaurant, and another restaurant located in a garden setting. It is on the edge of a park and zoo. The interior seems as if you’ve stepped into a 19th century botanical garden with steel beams and glass windows everywhere. The food at De Plantage is fresh and seasonal. Here is our original salad of sausage, watermelon, lentils and greens. These are not ingredients that I would naturally put together, but it worked and was delicious. Bleu Bistro is a centrally located French restaurant on the Canal Ring. We came upon it as we were actually headed somewhere else. We were drawn to to by its outdoor seating, cozy atmosphere, and friendly servers – even as we were still deciding and perusing the posted menu. It is located at Prinsenstraat 10HS. I didn’t get a chance to snap photos of our dinner choices, but we each coveted our dishes, and didn’t want to share, so I can attest that everything we had was delicious. We opted to sit outside in the still-summer weather. It felt like a comfortable living room. We were right next to our dining neighbors. Both were Dutch couples and were so friendly and willing to talk about Amsterdam, the food, anything really. Additionally, I can’t say enough nice things about the staff. They were also friendly, welcoming, helpful with selections, and overall delightful. They were the kind of the people you want to be friends with at the end of the evening. While, we didn’t get pictures of the main courses, dessert was definitely photo-worthy. The Chocolate Crumble was definitely not your run of the mill brownie topped with ice cream. First of all, it came in its own enormous copper bowl, and had a spatula as a utensil. All the better to scoop out the bowl of all its goodness. YUM!